We had a happy weekend in Sacramento. We visited with good friends AND Sonny Boy and his girlfriend were able to come up from Santa Cruz to join us. 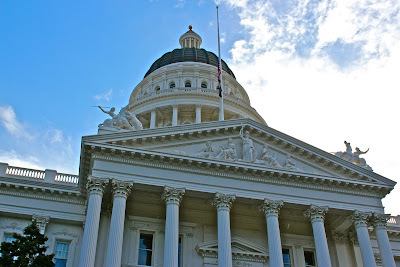 We visited the capitol building as part of our visit. Gotta love buildings like this. Dome Time! It was gorgeous. This was on the ceiling inside. 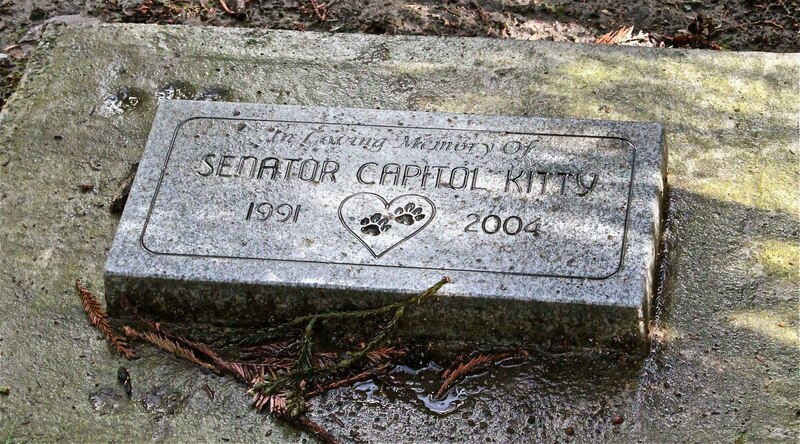 This is a memorial for a feral cat who lived on the capitol grounds for thirteen years. See was friendly and hung out on the south side of the capitol, the same side that houses the Senate--hence the name given to her. Betty approves of this memorial. Thanks for coming on this field trip with me! Now get back on the bus and you'll each get a snack. Thanks for taking us on a tour Betty! And how sweet is it that they gave kitty a place of honour ~ love it! BB your Capitol is beautiful especially against the blue sky. What a great tribute to the kitty, I'm not sure many places would have done the same. Ooh, Kitty....how sweet. And the stained glass. Breathtaking. You're such a good Betty, taking us everywhere you go. I love class trips. Love the dome! The colors are beautiful! OMG, that last photo made me all misty-eyed! It's nice to know that there are still sentimental animal-lovers out there who appreciate even the scruffiest of cats. Excellent. Memorial to a pussycat. Yay! I love the dome; it is absolutely gorgeous! and the memorial made me sad...yet happy that they cared enough to put a stone down in the kitty's honor! A classy trip it sounds. That is a great memorial to the Senator fur sure. Lovely tour Betty, felt I was there. it's pretty stinkin' awesome they memorialized the cat! Thanks for the tour. I approve the memorial for the kitty as well and I hope they fed her well. I love the memorial.. and the fact that you thought it important enough to photograph and share. They made a memorial for the cat - that was nice! That is some elaborate artwork on the outside of the capitol building. I'm not sure we have artisans capable of that kind of work anymore. The intricate designs in the dome are fascinating, too. I love buildings like that! I love going on Betty's field trips! That was a sweet memorial. Will my snack be chocolaty? I've known a few feral cats in my day. None with such a stunning monument. Must have been some real cat lovers there. Gorgeous photos. That kitty story touched my heart. Once again I wish I'd had a teacher like you during my field trip days!! Yes, the kitteh memorial is Very Good. Oh, what a sweet memorial! So, you got to see your son??! :) Sweet! I'm sure that was the best part of the trip. Great pictures! I've never been to Sacramento. I found you through Susan's blog, Wild Life in the Woods. Thanks for the field trip..
who drove the bus ??? I love field trips! And snacks! Kinda like the candy on your desk today huh? Thanks for letting me go on this field trip. So much better than the trip I didn't get to take in sixth grade. That memorial is so awesome! Aw, a kitty memorial is so sweet! Oh the pictures are great. 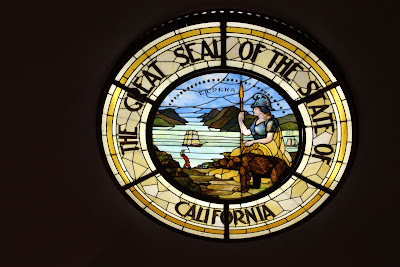 We lived in the Sacramento are four about four years. WE loved it. It was like one great big adventure.You can imagine being from the South it was a bit of a culture shock but we really loved living there. We saw and did so many wonderful things and one of them was taking a tour of the Capital. It is so beautiful and I love the dome. This post brought back great memories.Have you ever checked out the Blue Diamond Almond Factory on C Street? I love the gift shop there you can buy any and everything that they make. I am so glad that I have found your blog! A memorial for a feral cat? Best capitol ever. I love the memorial for the kitty! Beautiful photos - I do love buildings like that - but the memorial was the best part. Thanks for the tour! That sounds like a great day trip, Betty. Love the pics, especially that kitty memorial. At first I was going to say that I must have missed that marker stone for the kitty. Then I realized I haven't been there for a long time! The cat was still around last time I was there. Hi Betty ... love those photos of Sacramento - so interesting to see them. I love field trips with Betty. Especially in warm locations. I could almost feel the sun shining down on my poor heat-deprived body. Senator Kitty...I love that. 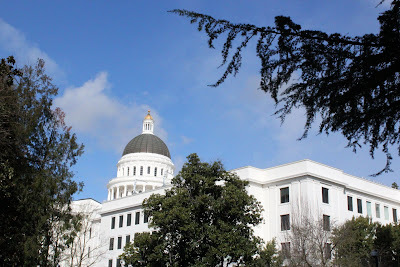 We visit Sacramento every spring when we leave CO to get out of the snow. You've shown me some parts of the Capitol I've never before seen. I'll look for the kitty's marker when I'm there in May. 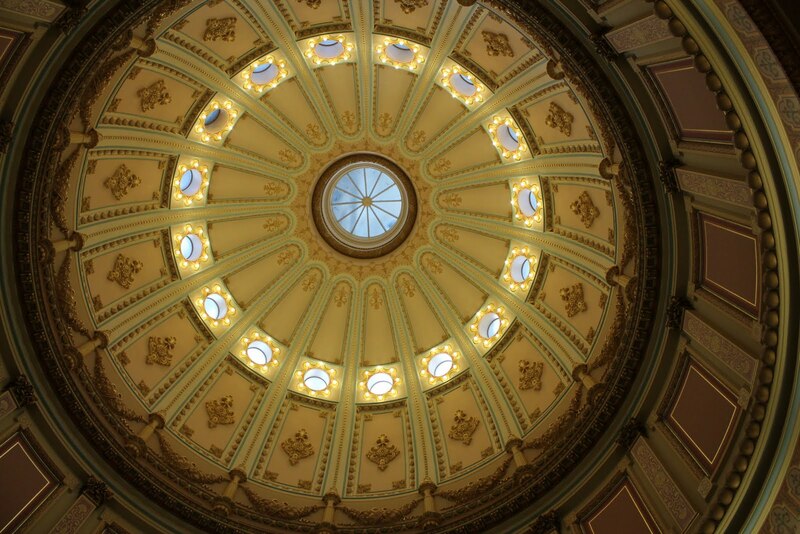 Your photo of the dome is wonderful. Monday Morning Flowers! Goodbye February!